I have been intrigued by a lot of the herbal remedies that have become more mainstream in the past years. Especially for gut and gums as that is where most of my sensitivities lie in. I'd never tried an herbal mouth wash before until I was approached by OraMD. OraMD's claim is that if you follow their 4 step regimen, the health of your teeth and gums will be greatly improved. I do not have the entire 4 step, just the tincture of oils, but I was told this alone would help a lot as it's the main fighter. 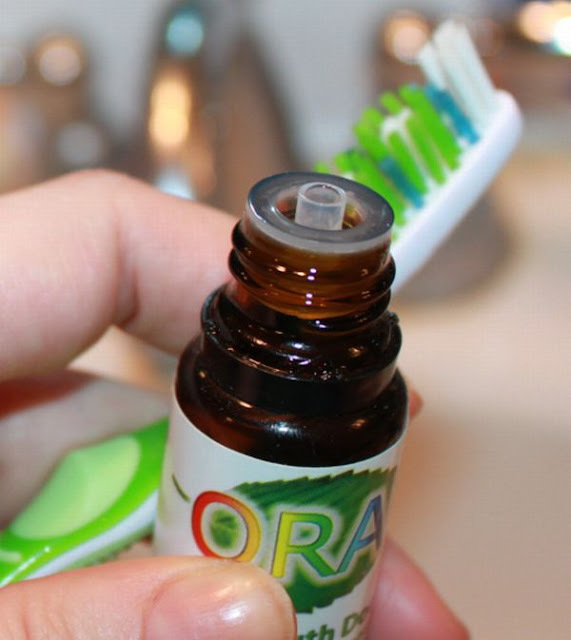 When I first started using the oils on my toothbrush, I put too many drops and really paid for it. That stuff "burned" like I lit a match to my gums. I was told this was the oil working on the bacteria lying in the gums and I believe it. I was also told that to put one drop next time. I did that and the burning was still there, though not nearly as severe. I liked the tingling effect, It made me feel like it was really working. However, I really think the bottle should say start out with 1 drop and see how you feel. It says put 2-5 drops. I know that it's working because this tincture includes antimicrobials and natural antibiotics I have read a lot about. OraMD is comprised of the following: 100% natural & pure Almond, Spearmint and Peppermint oils. It has a strong taste, but it doesn't bother me. Just don't expect a minty fresh taste. It's potent and smells a lot better than it tastes, like a lot of herbals. I used it once a day for a few months now and I wish I could claim that it reversed my gum problem like some testimonials have said, but that is not the case. I'm sure that it was working to kill bacteria, but to reverse a problem, not so much. I think it did help to make it easier to brush and floss gunk out of my teeth, but nothing changed in my sensitivities. They also have an X-Strength variety and maybe that is something I need. You may have different and better results than me. If I repurchase and it shows to have any impact on my gums in the future I will definitely follow up with my experience. Oramed's $22.95 price tag is rather expensive for me to keep up very long, but I may try the extra strength and see if that helps any. Right now, the manufacturer is willing to offer my readers one FREE bottle. They said they would love to have our readers try out OraMD and agreed to send one bottle FREE if our readers would pay a minimal shipping and handling charge. They also agreed to include 2 eye-opening reports called 1) “The 6 Hidden Dangers In Toothpaste” and 2) “Why The FDA Requires A Warning Label On Your Toothpaste.” That’s a total value of over $40.00. Click here to get your FREE bottle and FREE reports now. You can ALSO Like them on Facebook and get $5 off. If you'd like to learn more about OraMD, check out their Facebook and Twitter.